The Fourth Gospel, traditionally referred to as the Gospel According to John, provides the closest example of explicit reference to authorship, though it too remains originally anonymous. Church tradition has long linked the Fourth Gospel with three early epistles and the Apocalypse, which bears the author’s name, John. While debated (as all good scholarly truth claims are), there exists a good deal of evidence (vocabulary, structure, grammar, theology) indicating that the Fourth Gospel and the Apocalypse were written by the same individual. As for which John this author was, one cannot be entirely sure, though given the wording used at the end of the Gospel (20. 30-31 and 21. 24-25), it seems that the accounts of the gospel were written by an eyewitness (the beloved disciple—possibly John—or John the Apostle) or, as some scholars have suggested, by the extant faith tradition of an eyewitness. Many scholars date the composition of the gospel to the late first century CE and the first extant manuscript fragment has oft been dated to about 117-125 CE, meaning that even without an eyewitness account, the Fourth Gospel was written within two or three generations of the events described in the gospel. Very likely however, the gospel was written many years before the extant copy we have came into existence, meaning that it becomes highly likely that the Fourth gospel was composed by an eyewitness to the life, death, and resurrection of the Word, Jesus Christ. If John the Apostle was the author of John, why didn’t he use the first person when referring to himself in his gospel. He refers to himself in the third person sometimes using the name “the disciple whom Jesus loved”. To me this implies that the author was someone else who was writing down, as you wrote, “a faith tradition of an eyewitness [i.e. John the Apostle]”. Also, some have dated the Gospel according to John to have been written early second century which would have been after the life span of John the Apostle. What are your thoughts on this? As to the first, the use of the third person seems to be an example of literary humility. John won’t write about himself directly much the same way that many scholars think Paul doesn’t talk about himself directly in 2 Cor 12. Further, if someone else was writing the Gospel (even if it was a Johannine community), it’s not readily apparent why they would use that title to speak of John instead of just using his name. As for your second question, it’s widely recognized (even by those doubting Johannine authorship of the Fourth Gospel) that the tradition John lived a long time was fairly early and widespread (cx. John 21:15f). If we think John was about 20 years old or so around 30 CE, that means he could have lived and written a least a little past the year 100 CE. Additionally, the Fourth Gospel seems to have a terminal date of composition based on the John Ryland’s Fragment (P52), which is often dated to around 120 CE. 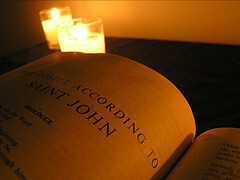 Even more problematic for even an early 2nd century date for John is its apparent use in early Christian writings from the early 2nd century, suggesting it was either a) in existence for some time before its use and/or b) it was immediately viewed as authoritative/scriptural by early Christians even outside the Johannine community.